The event will take place on Saturday 5 July 2014 on Bude Canal. Meeti in the crescent car park in Bude at 9.30 am for briefing. Provide opportunities for paddlers who have entered canoe racing via the DW race to experience a different form of racing and to continue their interest post DW. Development of a team for the National Schools Kayak Championships November 2014. Encourage interest and provide racing experience for future DW teams. Provide a fun activity for novice paddlers to develop an interest in the sport. To contribute to the Canoe England “Go Canoeing” initiative. There will be five categories: K1 Junior, K2 Junior, K1 Senior, K2 Senior and Novice K1/K2. To enter the junior category a paddler must be under 19 on the 31 August 2014. The novice category will be self-defining. Paddlers may enter more than one category unless they are entered as a novice. The event will be open to any craft which is propelled by a double bladed paddle with the paddler sitting; this includes general purpose kayaks, sea kayaks, racing K1/K2s, surf lifesaving racing skis, and recreational sit on kayaks. There will be no divisions, allowances or handicapping within the categories for the different craft. 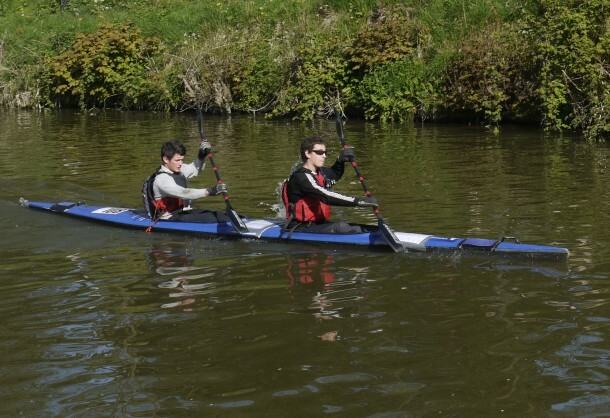 There will be a complete range of the above boats available for any paddler to use in the basin between the Falcon Bridge and the Scout Hut; these boats will be provided by Launceston College and Shoreline. Novice paddlers may borrow these boats to race by prior agreement. Tuition and safety supervision will be provided by Shoreline in this area. The course will be 2 km starting at the first lock and finishing at the Scout Hut, paddlers will race in pairs with the time deciding the placing for all paddlers, except for 1st and 2nd, in each category. The top two places will be decided by a separate side-by-side race final. All entrants will boat to the start prior to the start of racing for the category; they will start in pairs short intervals apart until all of the entrants have raced. Ten finalists will boat and then race after all five categories have been completed. Entries are now welcome and must be submitted either on line via the Launceston College online entry form (payment via PayPal) or in the post to Launceston College to be received no later than midday on Friday 27 June 2014. The entrance fee is £6 per seat. Anyone who completed the DW in 2014 or was a registered support crew for Launceston College will have entrance free. Refreshments will be available throughout the day and a presentation will take place at the end of the event on the bank of the canal.